Partly the brand - Boema have produced some /really/ awful products, partly the age - late 80s/early90s is unfashionable and had poor QC, and partly the 3gr nature means they're often 20A instead of 15W with the possibility of getting them down to less than 11A. Also weight - 80kg+ is a lot different to 40-65kg. The combo of brand, weight and age means perceived difficulty selling on, while probably no-one wants a machine they can't sell in times where money is hard to come by? I wouldn't have considered owning a 3 group Bo-ema until recently. In an odd way, they're kitch, and I do like them much more now. Having sold my lever recently, despite still having possession of it, I miss it already. The Aussie brand appeals to me. I've made some enquiries to the owner and might end up owning it. Oh well, we'll see how it goes. Different thing buying a 3 group for the home kitchen, I suspect the SO approval factor would be below zero. 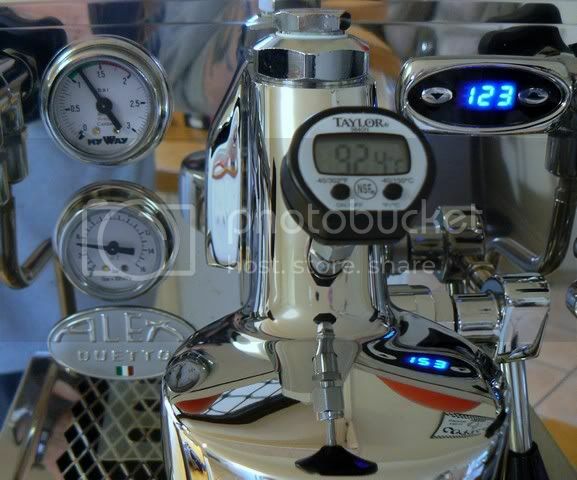 I was having a little drool over at the KVW site last night and I was wondering if the lady uses a riser block behind the counter to get to the levers Rancilio Class 6 I think. My missus let me have a 1m wide bench. Whatever coffee gear I can fit on that, I can have - Wouldn't leave much space for a grinder though. Have just spotted this worth a look if your after a lever machine..
And he even said on that other forum that price is very negotiable to see it go to a good home. I am tempted, very nice looking machine. Think this thread needs more pictures Couple of my larger Levers in use. Nice machines BF. I just hope AM doesn't notice those leads lying around! 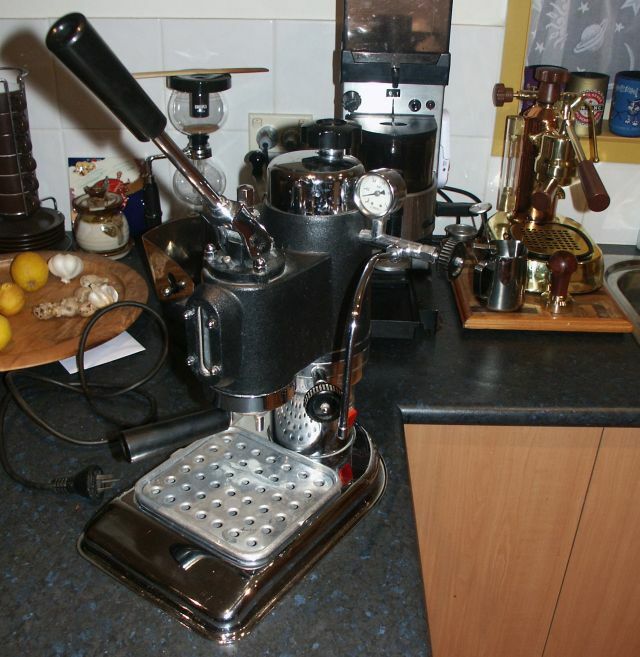 To far south and in to small a town for decent ginger The version of the Pavoni I have is already fully loaded with Timber including the boiler fill. I have an Izzo Pompeii Single Group Lever and it took my coffee to a whole new level. I find I can pull consistently great shots with minimal effort. I came from a Bezzera BZ35e - a pretty damn good machine in its own right, but not a patch on a commercial spring lever. Its also easier for my wife to pull great shots on, consistently, she loves the fact its so much less messy than a pump driven machine and she is much more confident pulling shots for visitors. I also love the quietness, combined with a Pharos hand grinder its almost a zen experience extracting coffee! I am a total convert to the Lever. Oh, nice to see some old online coffee mates here, Anger Management, Koffee Kosmo and Beanflying to name a few! I just gotta say: that is one of the most stunning pieces of equipment I can remember seeing, in any field. Liking the Bezzera plumbed in to KK. I think they misread the market for Lever buyers a little by not releasing the plumbed in one earlier themselves. I am considering the very machine I have a video of, as its was a first in the world to be tested by me I have a soft spot for it. If this machine turns out to be unreliable for the new buyer, who services a Slayer??? KK does the factory plumbed option still use a vibe pump. Lovely machine and I would have gone for one if it wasn't for the damn vibe. The beauty of levers I think is their simplicity. I really like the Bezzera BZ2006AL, as much of a box as it is and I wanted curves, it keeps the hot stuff away from my hands a lot better than majority of others. Interesting to know the other variants are available by order too KK. A lemon or Friday Machine. This is not a reflection of the brand by any means just a one of issue as far as I have ever read.